If there's any part of the UK that's looking forward to the benefits of growth, it's the North East of England. It has the highest rate of unemployment and the lowest rate of job creation in the country. More than 20% of workers in the North East are employed in the public sector, the highest proportion of the workforce in England. Public sector cuts have hit the region hard since 2010, but like the overall national picture the private sector in the region has continued to create jobs. 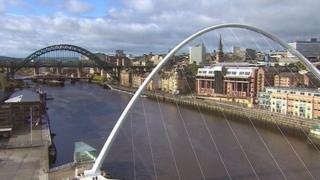 Exporters have thrived and the North East is now the only region in England that exports more than it imports. So how are businesses and workers feeling about the recovery? Chris Dennell thinks nothing of working seven days a week at the Quick Hydraulics factory in North Shields. The 29-year-old has been in the industry for nine years and has never seen business so good. "Work seems to have increased tenfold over the past few years. It's been a real challenge trying to keep up with demand. "We feel we have a responsibility to the company to get the work done - to keep things moving forward." The overtime Chris does at weekends has allowed him to save for his wedding. But despite being in a secure job with annual pay increases he's found the cost of living a challenge. "My wife and I have always budgeted for our monthly outgoings but with the price of gas and electricity going up, we have had to tighten our belts and cut down on the luxuries that we used to buy. "I've given up my season ticket for the football at Sunderland as I can only save for one thing at a time." Andrew Esson bought Quick Hydraulics two years ago and has not looked back since. The company has gone from 14 employees to 29 and he's hoping to take on more in the coming months. "We feel the pulse of business in the North East and what we are finding is that companies who weren't investing two years ago, are now having funds released and are kicking new projects into action." The company supplies parts to companies in industries ranging from oil and gas to paper processing. Sales are up 25% on last year, with many customers benefiting from booming emerging market economies. "Two years ago I would have said that if you were exporting to Europe, you were not doing well - but now we are seeing that anyone who's exporting is beginning to do well. "Our biggest challenge in the North East is that we have a skills shortage. "We had a board meeting this morning and we agreed to recruit some new staff to keep up with demand, but the challenge is to find people with the right skill levels." Media captionJames Ramsbotham: "We've very much got a two-speed economy"
As chairman of a local construction group, James Ramsbotham has seen the strain of the recession up close over the last five years. But in his role as head of the North East Chamber of Commerce, he's becoming increasingly optimistic about the recovery in the region. "Four years ago businesses like Nissan [based in Sunderland] were employing only 3,000 people, now they are employing 6,000. "We are also a major part of the supply chain for the oil and gas sector in the North Sea, which has thrived over the past few years." Mr Ramsbotham says that the nascent economic recovery is beginning to give businesses the confidence they need to expand. "In the first two quarters of this year, we saw some real confidence in sales - both domestic and export sales for which this region does so well. "Now what we've seen is that becoming a confidence to invest in plants and machinery, and also in taking on new staff and training them up." Although the private sector is creating jobs, Mr Ramsbotham says the public sector is still a drag on the local economy. "We've very much got a two-speed economy - we've got the really good engineering and manufacturing industries that are doing incredibly well. "But when you look up in the High Street and you see the retail sector on its knees, you realise the impact that the cuts in the public sector have had on spending in the region."